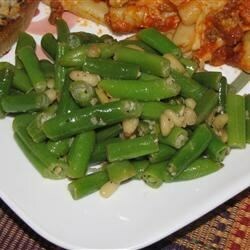 "This green bean dish can be served for a special occasion or for everyday just to tell your loved ones they are special. So simple!" Heat the olive oil in a skillet over medium heat. Stir in the garlic and pine nuts, and saute until lightly browned. Place the green beans in a medium saucepan with enough water to cover, and bring to a boil. Season with salt and pepper. Cook 5 minutes, or until tender. Drain, and toss with the garlic and pine nuts to serve. Loved the recipe, a nice fresh twist! Thanks for sharing. If you don't have Pine Nuts, you can use slivered almonds also.